Edwards AFB is situated in Kern, Los Angeles, and San Bernardino counties, approximately 100 miles north of the city of Los Angeles. The base consists of approximately 301,000 acres of largely undeveloped or semi-improved land that is used predominantly for aircraft test ranges and maintained and unmaintained landing sites (i.e., dry lake beds). According to the 1994 Base Comprehensive Plan, the developed portion of the base includes approximately 6 percent of the total base area and is concentrated on the west side of Rogers Dry Lake. It includes North Base, South Base, Main Base, and Family Housing areas. In the nomenclature of Edwards Air Force Base, North Base is also referred to as Operable Unit 10. Land uses associated with this area include airfield clearance, airfield pavement, aircraft operations and maintenance, engineering test, industrial, administrative, community commercial, community service, medical, accompanied and unaccompanied housing, outdoor recreation, and buffer zones. In addition, Air Force Research Lab, situated in the eastern portion of the base, includes a small developed area primarily used for administration, engineering, and testing related to rocket and propellant research, and community commercial uses. Edwards Air Force Base, on California's Mojave Desert about 100 miles northeast of Los Angeles, has two unique natural resources that help make it the premier flight test facility in all the world; Rogers and Rosamond dry lakebeds. The main Edwards concrete runway is located next to Rogers Dry Lake and combining this runway's 15,000 foot length with a 9,000 foot lakebed overrun gives pilots with an inflight emergency one of the longest and safest runways anywhere in the world. Rogers Dry Lake is the largest of the two and has been used since 1977 as the landing site for many space shuttle test and operational flights. But both lakebeds have been used for emergency and test landings of aircraft for more than 40 years. And these natural flat surfaces have literally saved hundreds of aircrew lives and aircraft valued at millions of dollars because they offer a broad expanse of hardened clay on which to land aircraft in emergency situations. Rogers Dry Lake has been declared a National Historic Landmark by the National Park Service, U.S. Department of Interior, because of its role in the development of the nation's space program and in the development of aerospace systems. Rogers has a surface of about 44 square miles and is the lakebed next to which the main Edwards complex has been developed. There are seven "drawn on" runways crisscrossing the surface of Rogers, with the longest 17/ 35 extending 7 1/2 miles. Rosamond Dry Lake, serveral miles southwest of Rogers, offers 21 square miles of smooth flat surface which is also used for routine flight test and research operations and for emergency landings. The lakebeds are among the lowest points in Antelope Valley and collect seasonal rain and snow runoff from surrounding hills and also from the San Gabriel Mountains to the south and the Tehachapi Mountains to the west. At one time the lakebeds contained water the year around, but changing geological and weather patterns are void of vegetation and contain water only after infrequent rains or snow falls. The flatness of the lakebeds was revealed following a measurement of the Rosamond lakebed surface which has a curvature of less than 18 inches over a distance of 30,000 feet. One of the problems associated with the supersonic X-1 research project was the matter of connecting the diminutive rocket plane to the launching bay of its "mother ship." Even with its bomb bay doors removed, the converted B-29 sat too close to the ground to clear its passenger. However, a simple solution proved to work very well. 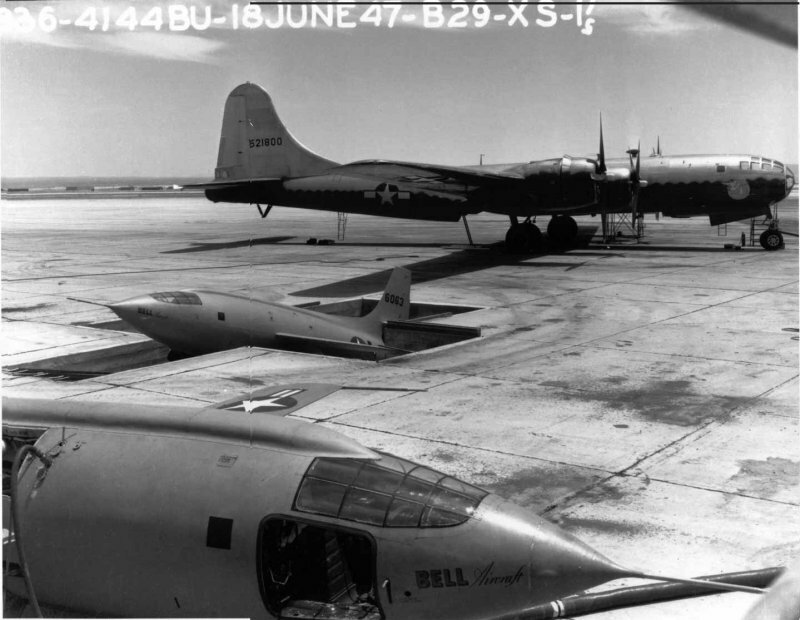 Early in 1946, Muroc Air Force Base engineers constructed a small, cruciform pit near the edge of the flight line which just fit the X-1. It was then an easy matter to roll the small rocket plane into the pit, tow the B-29 over it, and then hoist it up into the bay. Once secured by a bomb shackle, the X-1's water-alcohol and LOX tanks were topped off. Secretary of Defense Recommendations: Realign Edwards AFB by relocating base-level LANTIRN intermediate maintenance to Hill AFB, establishing a Centralized Intermediate Repair Facility (CIRF) for Low Altitude Navigation and Targeting Infrared for Night (LANTIRN) pods at Hill. Assuming no economic recovery, this recommendation could result in a maximum potential reduction of 4 jobs (2 direct jobs and 2 indirect jobs) over the 2006-2011 period in the Bakersfield, CA, Metropolitan Statistical economic area (less than 0.1 percent). DoD also recommended to realign Eglin AFB, FL, by relocating Air & Space Sensors, Electronic Warfare & Electronics and Information Systems Test & Evaluation to Edwards AFB. Secretary of Defense Justification: The Air Force distributed Reserve aircraft to Homestead Air Reserve Base (31) to create an optimum sized squadron that supports the homeland defense Air Sovereignty Alert mission. The remaining Reserve aircraft are distributed to the only other remaining Reserve F-16 squadron at Naval Air Station Joint Reserve Base Fort Worth (58). This laydown keeps the active/Air National Guard/ Air Force Reserve force structure mix constant. Creating CIRFs for LANTIRN pods and F110 engines establishes Hill as a maintenance workload center for these commodities. This recommendation compliments other CIRF recommendations as part of an Air Force effort to standardize stateside and deployed intermediate-level maintenance concepts, and will increase maintenance productivity and support to the warfighter. The second recommendation would reduce the number of technical facilities engaged in Air & Space Sensors, Electronic Warfare, and Electronics and Information Systems RDAT&E from 6 to 2. Through this consolidation, the Department would increase efficiency of RDAT&E operations resulting, in a multi-functional center of excellence in the rapidly changing technology area of C4ISR. Environmentally, this recommendation would have the potential to impact air quality at Edwards. Additional operations at Edwards might impact archeological sites, which might constrain operations. Additional operations on Edwards might impact threatened and endangered species and/or critical habitats. Community Concerns: There were no formal expressions from the community. Commission Findings: The Commission found that the realignment was consistent with the Air Force goals of creating larger more efficient fighter aircraft squadrons and improving intermediate level maintenance processes. The Commission found that Hill Air Force Base had capacity and conditions for current and future flying missions. The Commission also found that the Secretary of Defense's overall intent and concept of realigning F-16 aircraft out of Hill Air Force Base was supportable. The Commission supported the recommendation to establish Hill as a Centralized Intermediate Repair Facility for Low Attitude Navigation and Targeting Infrared for Night pods and for F-110 Engines. The Commission established an F-16 wing at Homestead Air Reserve Base, Florida and the Naval Air Station Joint Reserve Base Fort Worth, Texas. This recommendation is consistent with the Commission's Air National Guard and Air Force Reserve Laydown Plan. Realign Edwards Air Force Base, CA; Mountain Home Air Force Base, ID; and Luke Air Force Base, AZ, by relocating baselevel LANTIRN intermediate maintenance to Hill, establishing a Centralized Intermediate Repair Facility (CIRF) for Low Altitude Navigation and Targeting Infrared for Night (LANTIRN) pods at Hill AFB.